You can eat me even without toppings, cold or warm. Heat will melt the chocolate chips and enhance the flavour. These were very tasty and so clever. I have to wonder how they manage to cook them without melting all of that chocolate. 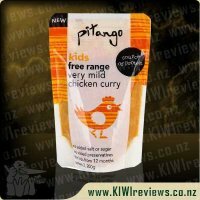 Because I don&apos;t get out of the house much, and have mokopuna do the shopping for me because I can&apos;t stand or walk for long enough to collect all the food, we had a lot of trouble finding a local supplier. 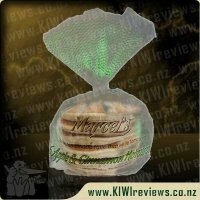 I asked the lovely folks at KIWIreviews if they could somehow send me the actual hotcakes and send them down to me because they don&apos;t seem to have any trouble finding them in the Waikato. These proved to be very tasty. They made a wonderful breakfast starter with some fresh fruit and a glass of fresh squeezed orange juice warmed up with a bit of honey in it. I only had two that way, but that was enough to keep this old koro full until lunch time. I had a visitor over for dinner the next night, and these stored well in the fridge overnight. After dinner, we decided to try these for dessert, so she kindly offered to try something. We had these chopped up into pieces and mixed with some diced fruit and some vanilla custard. 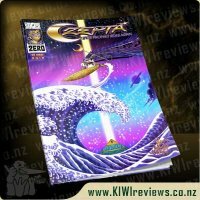 We both agreed that these were better than anything we could make ourselves, were very affordable and we hope to see them a little more widely available. Such a great brand, but so understocked in stores. 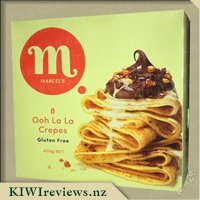 When my Marcel&apos;s hot cake vouchers arrived this morning I made a special trip to the one supermarket in town I had been told stocked them. 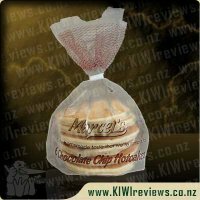 There were several other Marcel&apos;s products in the bakery chiller but not the chocolate chip hotcakes. I asked one of the bakery staff and they found some in the freezer out the back. I gave the kids the option of the chocolate chip or apple and cinnamon ones. They chose the chocolate chip like most kids would. They were still partially frozen when I went to serve them for afternoon tea to my excited kids so I looked at the heating directions on the packet. It suggested popping them in the toaster. This sounded so quick and simple but I was a bit unsure whether the chocolate would melt through my toaster. The chocolate chips were all inside rather than on the surface of the hotcake so I was spared the mess. I gave Miss 4.5 and Miss 3 one each with a spoonful of ice cream. It definitely was a hit with them. They wanted more. I convinced them to try the apple and cinnamon ones so I could try the chocolate chip ones myself. Oh the sacrifices of a product reviewer. I had mine the same way as the kids and I agree they are very good. The flavour isn&apos;t unlike a chocolate chip hot cross bun. Not too sweet but not bland either. The last couple of hot cakes will go in the lunch boxes tomorrow with a bit of butter. Hopefully we are able to resist the temptation as I will have two disappointed girls if they don&apos;t get any tomorrow. At $3.99 for a six pack they are not something I would buy every day but certainly cheaper than dining out, or MacDonald&apos;s plain hotcakes and much nicer than anything I could make. 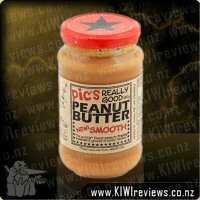 Wowzahs, this is a rather good product, it is full of flavour and very addictive. I had gotten this as well as the apple and cinnamon hotcakes, and always liked to have these with the other type as well. 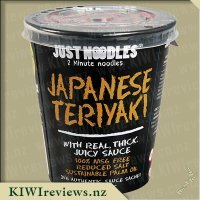 Don&apos;t get me wrong, these are awesome, but they were still a close 2nd to the other flavour, so I usually ate the apple ones first, and THEN had these. The flavour was great, it wasn&apos;t over-sweet, yet it wasn&apos;t bland at the same time, so the chocolate is a type that is like heaven on a plate but won&apos;t leave you with a sugar rush (this probably won&apos;t apply if these things are consumed by a 5-year-old, parents beware). 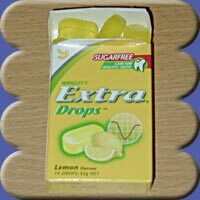 Just like the apple and cinnamon cakes, these were very addictive, I went through these just as fast as the other ones. One thing that proved to be a tad bit annoying was that after being in the microwave the chocolate chips embedded in the hotcakes went all gooey; so when I went to cut off a piece the knife and fork got thickly smeared with gooey chocolate that set fast and meant that I had to scrub most of the stuff that should have been in my stomach into the sink when I went to wash the cutlery. 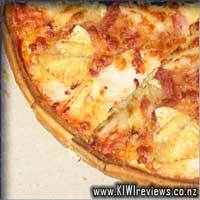 The quality was awesome, very nicely done, the cakes weren&apos;t sloppily made. Quantity was also great, 6 cakes per bag, it was a good-sized amount.The price is just right, it is in the "Goldilocks" zone, not to expensive as to restrict the number of people who can buy them, yet not too cheap in proportion to the product&apos;s value as too made people have second thoughts about buying these. 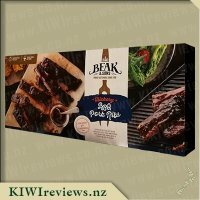 Taste is wonderful, it as I have said numerous times throughout the review, and the portion size is good, perfect to use in a single family dessert.. If there is anything more for me to say, it will have to be: ah Marcel&apos;s, you&apos;ve done it again! A year ago I was going to McDonalds every weekend for their hotcakes meals. I was easily spending 30 dollars a visit. 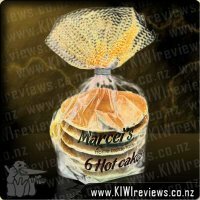 Then I discovered Marcel&apos;s. For less than the price of a happy meal I could feed my whole family delicious hot cakes. Recently I was given the opportunity to try these yummy chocolate chip hotcakes and I must admit that I knew right away that these would be a hit. The first thing I did with these pancakes was to make an afternoon tea snack for my eldest daughter while baby was having her nap. We worked together on the snack. Firstly using the hotcake as a base, we added some icing for eyes, nose and mouth. My daughter added some kisses on the cheeks and I added some chocolate buttons and hair as well. This was so fun and some lovely mother/daughter time. She then sat and enjoyed her hotcake snack. Once all the icing was licked off and the lollies eaten, I noticed that she was digging the chocolate chips out of the hotcake. Then she consumed the remaining hotcake. I was a little worried that she would leave it behind, but she does love Marcel&apos;s hotcakes and I needn&apos;t have worried at all. Today I also made a breakfast picture for her using these hotcakes. I cut out two bunny rabbits and some flowers. It was so easy to use the cookie cutters on the hotcakes and they didn&apos;t crumble at all. I decorated the picture and added maple syrup for the background. My daughter woke to this and thought it must have been a special day. She was a little disappointed with me when I said it was "Happy Wednesday". But she was not disappointed with her hotcake bunnies. She loved them. I took the offcuts to work with me for my morning tea, along with offcuts of the other flavour we were given to try. I preferred the chocolate chip flavour over the apple ones. The chocolate chips had a more consistent texture. There weren&apos;t any moist patches with the chocolate chips flavour, which I just liked better. Flavour-wise, I like chocolate a lot more than I like apple. 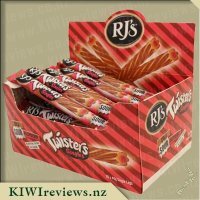 I think we would happily buy the chocolate chip flavour again as it is one that the whole family will enjoy. 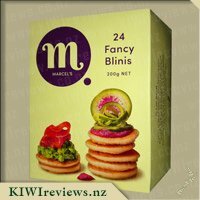 Thanks so much Marcel&apos;s and KIWIreviews for selecting us to try these products.